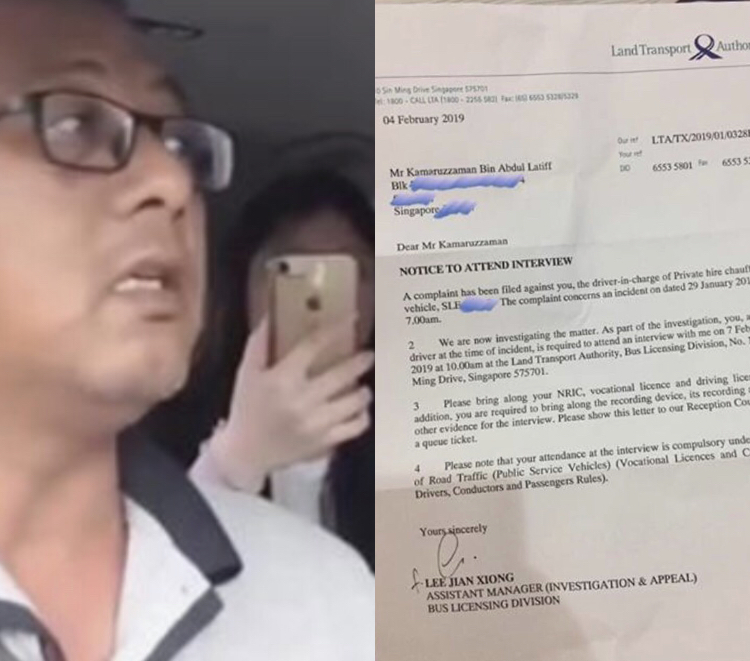 Kamaruzzaman Abdul Latiff, a driver for ride-hailing service Go-Jek, posted a 7-minute video, now gone viral, of himself with a woman who accused him of taking her hostage when what he was doing was taking her to a police station to settle a dispute between them. He posted this video on Go-Jek Singapore Community Facebook page on January 31, which has been viewed hundreds of thousands of times. Kamaruzzaman has received a summons from the Land Transport Authority (LTA) to appear before them in an interview on Thursday, February 7, at 10 o’clock in the morning. The Go-Jek driver is required to bring his vocational license, driver’s license, as well as “the recording device, its recording, and any other evidence”. The LTA states that Kamaruzzaman’s attendance at the interview is completely compulsory due to Rule 18 of Road Traffic. In the video that Kamaruzzaman posted last week, he is seen driving a passenger who got upset that he was passing through Electronic Road Pricing (ERP) gantries during the course of her ride. She accuses him of trying to cheat her out of her money. The passenger made a phone call, wherein the person she talked to can be heard telling Kamaruzzaman, “you have no right to take her hostage” and “you are causing her to lose her freedom”. The driver had decided to bring her to the nearest police station in order to settle the matter in a civil manner. They arrived at Toa Payoh Lorong 4. However, the woman got hysterical, claiming that the driver had locked her into the car with the intent of kidnapping her. Kamaruzzaman claims that the auto-lock function of his vehicle had merely done its job. Even the police tried to placate and assure the passenger concerning the auto-locked door.